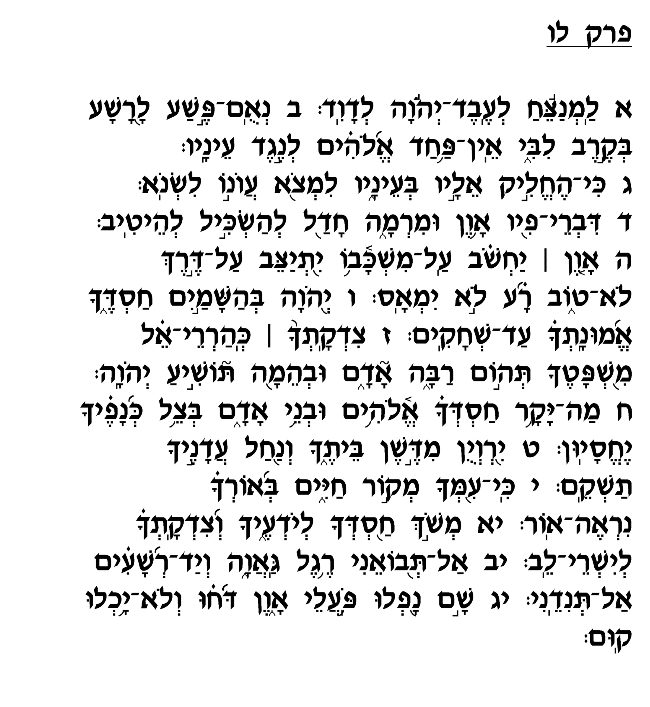 In the first section of this Psalm, David describes the machinations of the Yetzer Ha'ra, the evil inclination, in its effort to lead a person to sin. It slyly convinces the individual that no harm will result from wrongdoing, that he will not suffer any punishment, and evil therefore need not be abhorred or avoided. Sinners accept these false claims of the Yetzer Ha'ra and act as they please without any concern for the repercussions of their sinful conduct. The rest of this chapter describes the Almighty's kindness towards people. Rashi explains these verses as referring to the discretion with which God displays His kindness, reserving it only for the righteous. Contrary to the arguments of the Yetzer Ha'ra, the Almighty indeed treats people in accordance with their level of piety. His kindness is too "precious" (verse 8) for the wicked; it is therefore reserved specifically for those who are sincerely devoted to God. The first verse of this Psalm indicates that it was composed "for the servant of God." As the Radak explains, a servant is somebody with a sense of accountability to a higher authority. David here instructs that to be an "Eved Hashem," a servant of God, one must recognize that he is under God's authority and is thus held accountable for his conduct. Rather than allow ourselves to be misled by the clever schemes of the Yetzer Ha'ra, we must instead reinforce our awareness of God's authority and the potential consequences of our actions.